This natural treasure is filled with red rock canyons, towering monoliths, and a plethora of wildlife to watch. High on the Colorado Plateau near Grand Junction sits a wonderland of adventure and beauty that you really have to experience for yourself. The Colorado National Monument, established in 1911, offers camping, backpacking, hiking, road biking, rock climbing, and so much more. The monument area spans around 20,000 acres and draws in around 375,000 visitors per year. The park welcomes visitors year-round and offers a host of things to do that the whole family will enjoy. There are more than 40 miles of hiking trails, featuring long and short distances, to accommodate all experience levels. This includes several that you can take from your car if you are more into short sightseeing than hoofing it up a canyon. Monument Canyon Trail, a 5.8-mile (one-way) jaunt, is ideal for intermediate hikers who want to see wildlife. It will take you by stunning rock formations while it descends into Monument Canyon. Keep your eyes peeled because this is the best trail to peep some bighorn sheep! Otto's Trail, a 0.4-mile (one-way) walk is a must-do for photographers. The trail will wind through juniper trees leading you to monoliths, as well as sweeping views of the monument's canyons. Window Rock Trail, another 0.3-mile (round trip) stroll is ideal for catching the breathtaking beauty that the monument has to offer. Check out the canyons and monoliths, and don't forget to look down to check out a rock window. Only road bikes are allowed in Colorado National Monument in order to preserve the pristine beauty and environment. 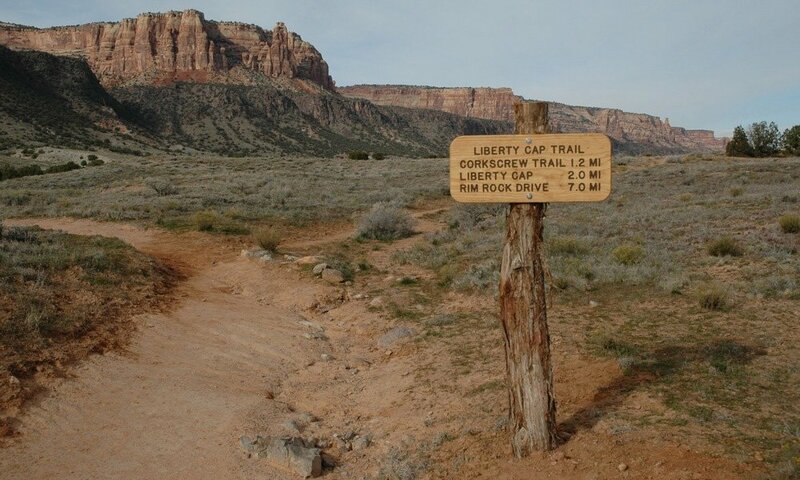 But, sticking to the road, for both cars and bikes, will still give you the views of the park that you seek, either traveling on the 23-mile Rim Rock Drive, cycling the 33-mile grand loop, or taking your wheels (of the two or four variety) up to the top of the mesa. "Colorado National Monument's Rim Rock Drive is one of the most spectacular drives in the United States. Redrock canyons, crisp blue skies, and verdant green juniper splash fantastic views along the way for motorists and bicyclists," says the National Park Service. Please check out the NPS's guidelines and rules to keep everyone safe on the road. Saddlehorn Campground can serve as your home away from home while you are visiting the monument. It's open all year and offers both reservation and open camping sites. You can also get a real feel for Colorado National Monument by backpacking in and staying a few days. A permit from the visitor center is all that is required to sleep under the monoliths and starry Colorado sky. Rock climbing is allowed at Colorado National Monument, and there are several companies that are approved guides if you choose not to go it on your own. Climbers can climb most rock face in the park (please check latest regulations before you do so), including the Independence Monument, Sentinal Spire, and more. There's so much more to explore about the monument, so you'll just have to visit for yourself. Not to mention all the fun and interesting places to see in the nearby Grand Valley, such as other natural areas, wineries, and more! 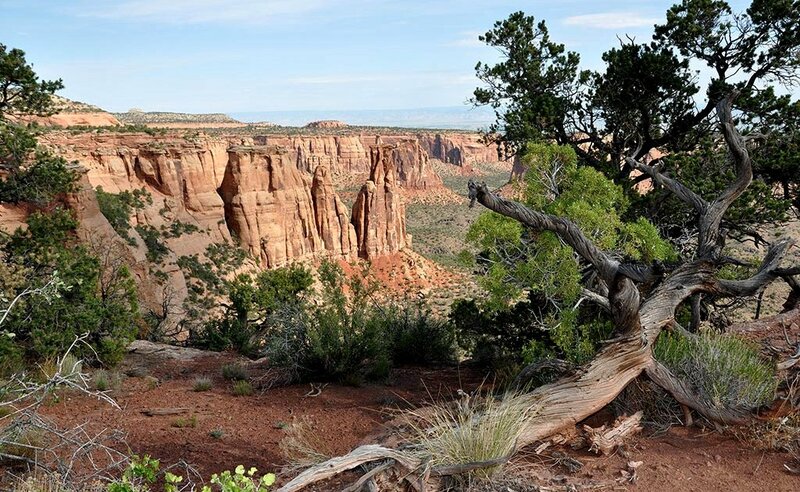 Check out the NPS Colorado National Monument website to get started planning your adventure!